Published: July 1, 2015 at 09:58 a.m. Updated: July 1, 2015 at 11:54 a.m.
Who is your front man of choice? Eddie Vedder? David Lee Roth? Gordon Lightfoot? OK, many of you probably haven't heard of that last guy, but most assuredly you all know the NFL's 32 front men -- that is to say, the 32 head coaches I was tasked with ranking. Speaking of Lightfoot, if you could read my mind, you'd guess No. 1. Probably not No. 3, though. The challenging part: Weighing the stacked résumés of the Tom Coughlins of the world against the promise of successful upstarts like Chip Kelly. And in the late teens/early 20s, the process became increasingly difficult. We tried to balance "What have you done for me lately?" and career accomplishments. Feel free to share your take here: @HarrisonNFL. For comparison's sake, here is last year's ranking. 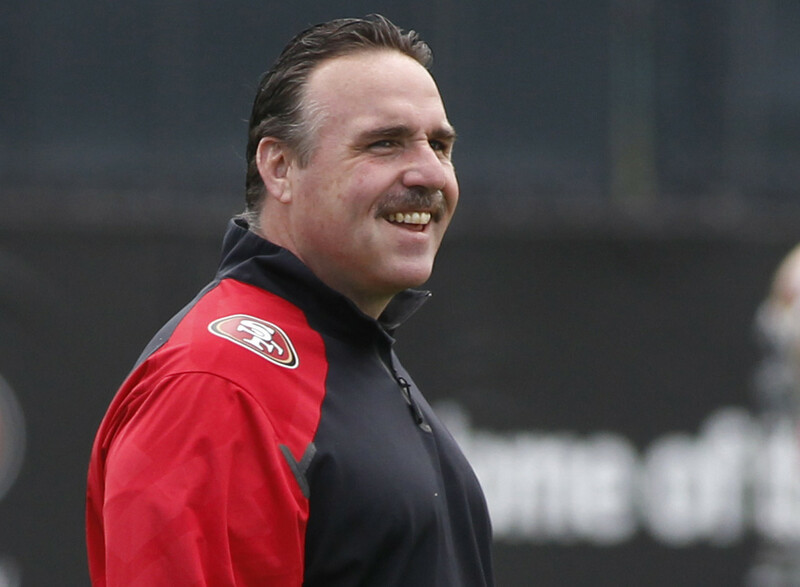 Tomsula is our caboose, mostly because he inherited the worst situation. It's not like the 49ers are devoid of talent, but this has been an offseason of turmoil. Unlike the other rookie head coaches, Tomsula is following a guy in Jim Harbaugh who manifested incredible success. It would help if players quit retiring. Quinn looks like the right man for the job in Atlanta, as the main issue for the organization the last few seasons has been its defense. Some Falcons fans, of course, would cite leadership, clock management and whatever other gripes they had with former coach Mike Smith. Whatever you think of Smith, Atlanta will be hard-pressed to match the success he had without turning around the defense. Bowles is our highest-ranked coach among those who have never had their own head gig before (interim stints aside). Bowles won Assistant Coach of the Year -- and universal kudos -- for his performance as the Cardinals defensive coordinator last season. Does it mean he'll excel as head coach? Not necessarily. But I like the way he handled questions about Geno Smith and his need to earn his place this offseason. Quarterback struggles have been at the center of Gruden's brief tenure in Washington. Fair or not, it appears Gruden's success is directly tied to the performance of Robert Griffin III, as the club did not draft a quarterback, and neither Kirk Cousins nor Colt McCoy appear to be the answer. That said, one year does not make a coaching career. Let's see what the revamped defense can do to keep the Redskins in games this season. Pettine looked to have things turned around in Cleveland last season, getting off to a promising 7-4 start -- and then the bottom fell out. Turning to Johnny Manziel at quarterback didn't do anything to brighten the gloomy finish to the year. Pettine's defensive background should come in handy, as the Browns have plenty of young talent to work with, players -- like former first-round pick Justin Gilbert -- who, if they pan out, could make quite a difference going forward. However, Pettine must also prove he and his staff can work wonders with quarterbacks. Bradley simply hasn't had the talent that other coaches on our list have enjoyed in his two seasons in charge. The general consensus around the league seems to be that Bradley will turn Jacksonville around, provided he's given the second-most precious commodity a head coach can possess: time. If you watched the Jags close enough last year, you saw signs this club is ready to take the next step. Bradley, who cut his teeth as Pete Carroll's defensive coordinator in Seattle, has a positive vibe that is infectious. Let's see what his young roster does this season. Del Rio might have wondered when he was going to get another opportunity to steward an NFL franchise. Now he has that second chance, and it comes with maybe the toughest assignment in pro football: turning around the most woeful franchise in the league. Del Rio's expertise is on the defensive side of the ball, and that is precisely where he will have his work cut out for him, as Oakland must improve there. At least he has young talent to work with. That wasn't always the case toward the end of his tenure with the Jaguars. Some eyebrows were raised when the Dolphins extended Philbin through the 2016 season. It's not that the former Packers offensive coordinator has been a failure, rather that the Dolphins have been stuck in neutral since he came on board in 2012; Miami has finished 7-9, 8-8 and 8-8 in his three years. That said, Ryan Tannehill has improved each year under Philbin and his staff. Plus, the Dolphins added Ndamukong Suh, and Tom Brady is currently set to miss four games -- so perhaps this is the year. One season might not provide enough evidence for us to gauge what kind of head coach a guy is. Yet, given how Zimmer made Minnesota competitive despite starting a rookie quarterback and playing without his best player, it's impossible to not notice the job he's doing. Tack on how he handled the Adrian Peterson situation this offseason and you have the makings of a solid organizational leader. The 2014 Bengals surely missed what he used to bring to their defensive coordinator post. O'Brien's first season in Houston can't be deemed anything but a success. The Texans lost not one but two starting quarterbacks at various points, while playing most of the season without the No. 1 overall pick in the 2014 NFL Draft. Jadeveon Clowney aside, O'Brien is used to dealing with circumstances out of his control, as his successful run at Penn State indicates. Ugh ... so not fair putting McCoy here. From what we've seen over two seasons, McCoy probably deserves to be higher. He led the Chargers to a playoff appearance his first season and almost did the same last year, despite the myriad injuries San Diego endured. This team played multiple centers and started three different running backs. OK, so maybe the Chargers only went 9-7 in each of his two campaigns. They certainly have been in the thick of things, and McCoy has drawn improved play out of Philip Rivers. Whisenhunt's expression in postgame press conferences last year tells you what kind of toll the Titans' showing took on him. Putting a coach who directed the Cardinals (of all franchises) to Super Bowl XLIII at No. 21 might be counterintuitive, but Whisenhunt hasn't been a winning head coach since 2009. Still, those who say Arizona only went to that Super Bowl because of Kurt Warner must understand who chose Warner to start over Matt Leinart, despite the Cards' considerable investment in the latter player. You could make an argument for Kubiak to be ranked anywhere in the large midsection of this list, but No. 20 feels like the right spot. Most league observers feel he is a solid fit for both the Broncos and Peyton Manning. The last time we saw Kubiak as a head coach, he was leading a Texans team that finished with the worst record in pro football in 2013. Yet, he did take Houston to two straight playoff appearances, winning a game each time. With eight years of head-coaching experience, Kubiak is also a little more well-versed about the demands of the job than most of those below him on this list. Where do you put Ryan? Is he a brash front man who doesn't do well with quarterbacks and was responsible for the New York Jets' crumbling performance last season? Or is he a fantastic motivator, the man who took the Jets to AFC Championship Game appearances in 2009 and '10, only to be led off the road by a front office that made poor decision after poor decision? Like Ken Whisenhunt, Smith endured an extremely difficult 2014 season that left him with a high draft pick but dinged his reputation. Don't misread this ranking; I'm not disrespecting Smith's overall career. Bears management was ready to be rid of Smith and his 10-6 record following the 2012 season -- and the team promptly won a total of 13 games over the next two seasons without him. What will Smith do this season? Tough to say with a rookie QB, but 86 wins in the NFL -- Smith's lifetime total -- is no joke. Though he's coming off a 2-14 campaign, Smith still has a winning record in the pros. The 2013 Coach of the Year took a step back last season, at least in terms of the win-loss record, but he still has his Panthers headed in the right direction. That starts with the fact that Carolina did not take a step back in the standings, winning its second straight NFC South title. It continues with the new deal for quarterback Cam Newton. And perhaps it will be underlined by a defense that finished 2014 hot. That side of the ball has always been Rivera's best; what he and his staff are able to accomplish on the offensive side is what will determine this club's fate in 2015. To be blunt, the reaction to last offseason's hiring of Caldwell was less than enthusiastic. It felt like analysts and fans alike chalked up his Super Bowl appearance with the Colts to the presence of Peyton Manning. After Manning was hurt, Indy tanked. Then Caldwell took over a Lions team that had gone 11-21 the previous two seasons. All the mild-mannered coach did was turn Detroit around, making what tended to usually be one of the league's worst teams down the stretch into a sturdy 11-5 playoff club. Fisher has placed higher on this list in past seasons, but at some point, we must acknowledge the mediocrity of his recent Rams teams, despite his long NFL tenure. We won't deny the fantastic job he did in Tennessee, managing that team's relocation from Houston and getting the franchise to its first (and only) Super Bowl, but finishes of 7-8-1, 7-9 and 6-10 in St. Louis have affected his standing. Garrett was one of the more difficult head coaches to rank. It seems like folks are more underwhelmed than wowed by him, but it's tough to find serious flaws in his coaching record. Garrett took over a 1-7 team in Week 10 of the 2010 season and led Dallas to a 5-3 finish down the stretch -- with Jon Kitna at quarterback. While his Cowboys finished 8-8 three seasons in a row, they were in position to win the NFC East in Week 17 of each campaign. In 2013, hopes were dashed when Tony Romo was injured for the season finale. Last year, Garrett and the Cowboys surprised everyone, actually raising hopes with a 12-4 mark and a two-game playoff run. After talking to people around the NFL Media offices and perusing the various opinions in the social media universe, it would seem there are legions of people out there who would take Kelly as their head coach in a second. No relatively new coach has received the kind of pub Kelly has over the last two years. So how good is he? Well, he's compiled a 20-12 regular-season record and made a one-and-done appearance in the 2013 playoffs. While his system hasn't exactly revolutionized the league as some expected, you have to give the man props for doing what he's done with quarterbacks like Nick Foles and Mark Sanchez. Is this too low for Kelly? Or too high? Your take is welcome ... @HarrisonNFL. Lewis, who had never been a head coach before landing the Bengals job, is entering his 13th season in Cincinnati, giving him the second-longest tenure among NFL coaches with their current teams, behind only Bill Belichick (who is entering his 16th season in New England). That is obviously impressive in this day and age of merry-go-round coaching hires, dismissals and "mutual" splits. So is the fact that Cincy has made the playoffs in five of the last six seasons. At some point, of course, the Bengals will actually have to win a playoff game, or history will look at Lewis as just a guy. Back in 2012, no one really knew what to think of Pagano -- specifically with regard to what kind of job he could do. He'd implemented a plan for the Colts, only to miss almost the entire season while fighting leukemia. Yet, over the last two seasons, Indianapolis has improved, winning one additional playoff game each season. His players play for him, and that, as much as anything, is indicative of a solid head coach. One of the most veteran head coaches on our list, Reid has the skins on the wall to make the top 10. He led the Eagles to four straight NFC title games in the early 2000s and a fifth in 2008 ... after Philadelphia had been in all of one championship game since 1960. In his first season in Kansas City, Reid directed the Chiefs to the postseason. They lost their wild-card matchup with the Colts by one point -- and lost six players to injury in that game, including star running back Jamaal Charles. Injuries also helped hold Kansas City back in a playoff-less 2014. With the defense healthier and receiver Jeremy Maclin now on board, the Chiefs could win the AFC West in 2015. Like Andy Reid, Fox has been at this profession a long time. Perhaps I'm misreading the tea leaves, but does it seem like most fans either a) don't think much of Fox or b) don't think he will make much of a difference in Chicago this year? Fox won four straight AFC West titles with the Broncos, including one with Tim Tebow at quarterback. In Carolina, he rode an unknown in Jake Delhomme to Super Bowl XXXVIII. Wherever he's been, the defense has improved. Give the man his respect. It was not easy to place a two-time Super Bowl champion at No. 8. After all, Bill Belichick is the only other coach on this list to have won multiple titles. But at the same time, the Giants have failed to make the playoffs in five of the last six seasons. The bottom line is, Coughlin still holds the respect of his players. With the return to health of receiver Victor Cruz, whose 2014 was shortened by a torn patellar tendon, the emergence of phenom Odell Beckham Jr. and the full integration of coordinator Ben McAdoo's new offense, the Giants could very well challenge for the NFC East title in 2015. Arians just won his second Coach of the Year award in three years -- and he wasn't even officially a head coach when he captured it in 2012 for his work with the Colts as Chuck Pagano's temporary fill-in. Running his own ship in Arizona, Arians has gone 10-6 and 11-5 in the past two seasons, despite dealing with a flurry of injuries last year that would have deep-sixed many teams. The next step for Arians is to win in the playoffs. Some might feel Tomlin should not rate this high. But who else are you going to put above him? He's never suffered a losing campaign, and he's been to two Super Bowls in his eight seasons on the job, winning one in his second year. Many thought the Steelers would be headed back to the big game -- or at least making a deep run into the playoffs -- before Le'Veon Bell went down in Week 17. All in all, it's been a nice run for the third man to fill this role since 1969. His Saints took a step back in 2014, finishing at 7-9. Still, Payton remains one of the top minds in pro football. The defense was mostly the culprit last season, although Payton's once-powerful offense was also inconsistent. En route to just the second sub-.500 season on his head-coaching résumé, Payton promised lineup changes, and a big one came when the club shipped All-Pro tight end Jimmy Graham to Seattle. Payton ranks this highly because you can't ignore the organizational turnaround he engineered upon arrival in 2006, or the fact that he delivered a Super Bowl title in the 2009 season. Harbaugh's run in Baltimore rivals that of the best coaches of all time. While it might be hard to think of him in such lofty terms, consider that the Ravens have made the postseason in six of Harbaugh's seven seasons at the helm, nabbing a Lombardi Trophy in the 2012 season, to boot. He's also 10-5 all-time in the playoffs. Carroll has earned this spot. Forget the consecutive Super Bowl appearances of the past two seasons. Carroll is a peerless master motivator whose players seem to love playing for him. The aspect of his coaching style worth admiring the most: He doesn't stand in the way of his assistants, encouraging them to further their careers -- with two of his former subordinates, Gus Bradley and Dan Quinn, finding their way onto this list over the past two years. One could view the pursuit of his staff by other teams as a sign that the Seahawks' way is the right way. This is an easy choice, Spygate or no Spygate. Find another active head coach who has four Super Bowl titles, 12 playoff appearances and the respect of every other head coach (save for maybe Rex Ryan on a surly day). Oh, and don't forget about the two rings Belichick won as a defensive coordinator with the Giants.